Election forecasts have been a contentious issue this cycle, with national polls showing a tight race for the popular vote, while statistically driven models such as FiveThirtyEight suggest that Obama's chances of winning the electoral college vote are very good. 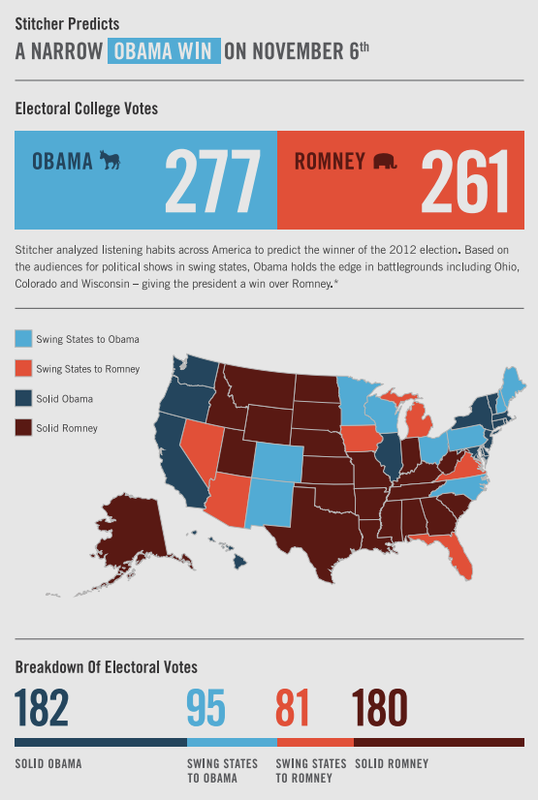 The people behind talk radio and podcasts app Sticher have put together an infographic that shows how the election would shake out according to the listening habits of its users. Drawing on more than 50,000 hours of listening data from October 23–29, Stitcher, which has a dedicated Election Center, monitored preferences for liberal or conservative political shows and found Obama is likely to sneak to victory by a slender margin tomorrow. Keep in mind that it's obvious that anyone who listens to podcasts is obviously a vegetarian, peace-loving beatnik from California. Otherwise, they'd be watching Fox News. Meanwhile, the rest of the world is watching with just as much as interest as folks here in the US. They understand that whoever leads the US affects their lives, too. BiNu, a cloud-powered app platform that helps feature phone users get speedy access to popular Web services, has surveyed more than 6,000 of their users around the world so see what they think of the US presidential election. Findings: Most of them know it's happening, most of them care a lot, and most of them prefer Obama. Strikingly, most biNu users, who are concentrated in developing markets, think Obama has helped the world become a better place. And they don't even get Obamacare.